Manufacturer: Audio Note Co., LTD.
've been tube fan for a long time now, from the moment first (quite inexpensive in fact) SET landed in my room and took me for unforgettable musical adventure. Don't get me wrong – there are a lot of high quality solid-state devices offering great performance – I'm not an enemy of solid-state. My (personal) point is that whenever I want not only to enjoy but also to experience music, to live it (which in my opinion is the whole point of our audiophile hobby) I choose a “tube” system to do that for me. It is my personal choice based on my experience, expectations and I am fully aware that it means (as any other choice would) a certain compromise. In the beginning I listened mostly to relatively inexpensive tube amplifiers made in Poland (Amplifon, Delta), but I also had a 300B amplifier from Ukraine (Abraxas). It was only later that I had a chance to listen to products of some well known brands, but even before that happened I searched information on the Internet and one of the names that stood out was a Japanese company called Kondo. I remember that my first encounter with this name was on some (probably American) audio forum, where some owner of one of their devices described his experience with it in such a manner that Kondo became a synonym of a “tube nirvana” for me. After that I searched the web intensively looking for any and every piece of information about this brand. Please take into consideration that since it was several years ago there was much less information available than it is today. At some point I came across some interviews with Kondo-san, and I found out that what drove him was a distinct memory of a concert he'd attended as teenager of classical music, that was conducted by the great ArturoToscanini. 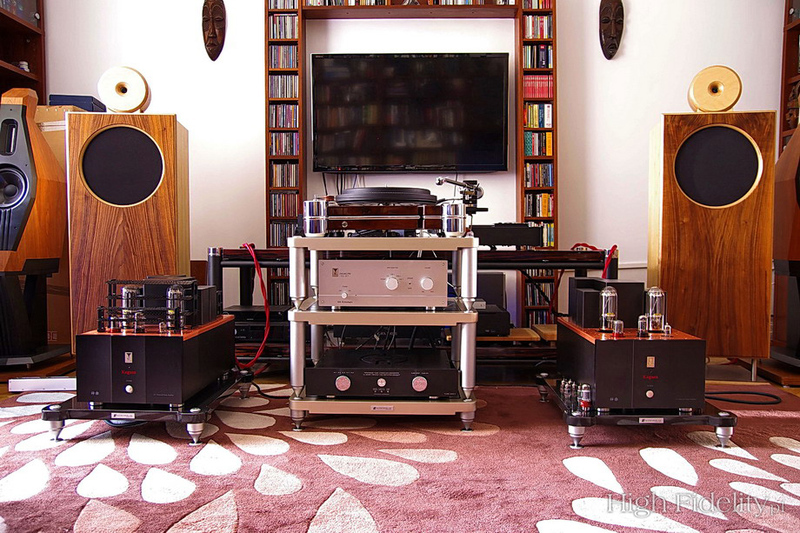 The ultimate goal of Mr Kondo was to achieve a level of sound reproduction that would allow him to relieve this amazing, unforgettable experience. Since I always loved live music, including classical one, this philosophy was something I could definitely identify myself with. In April 2013 (what a memorable date for me!) I had a chance to review a 2A3 SET called Souga and that was THE moment when one of my dreams came true. That test lasted few days and left unforgettable memories. It was something I might one day tell my grand kids about. Well, most likely they will treat me like an old full as at the time they will be used to listening to heavily compressed music played directly from a cloud via chips implanted in their brains, but I won't mind telling them anyway. Souga offered a level of intimacy between me and my favorite music as none other amplifier had ever before. It was not only about listening to the music but experiencing it, living it, it delivered an emotional connection with music that was so intense that it could only be compared to emotions one experiences during live event. Sure it still wasn't a live event – that is simply impossible no matter how much money you spend on a system, but it was as close to it as it gets. The conclusion from that review was simple – should I ever have 50 kEUR to spare Souga would be mine. Having Souga was like having a Piece of ART at home, or not just a piece but a MASTERPIECE. People pay millions to have a painting or sculpture to look at. Souga offered so much more! Time with Souga passed very quickly which was really sad also because I thought it would be the only chance to listen to any Audio Note Japan product at my home. Let me add a small addendum to this text – I wrote it after my visit to High End Show in Munich. As you can probably imagine after reading this text, once I got to Munich I had to find Kondo's room there and to spend quite a lot of time in there. In fact this was a room I spent most time in during three days of Show, I came back many times and sat there for long, long minutes. The (almost) complete Kondo system consisted of new Kondo Biyura loudspeakers (the ones that didn't make it to Warsaw AudioShow), driven by new monoblocks with twin 211 in PSE, called Kagura, that probably will be placed above Gakuon model in company's portfolio (or maybe replace it?). There were two source – an analogue one - Kondo Ginga turntable, and a digital one with Kondo DAC and Esoteric transport. Of course there was also a M1000 mkII preamplifier and silver cables. The Kondo crew used mostly jazz and classical music for presentations, mostly selected older recordings, but some contemporary too. And regardless of how old the recording was, or what medium was used system gave me the same thrill as Souga in my system did. Obviously the general circumstances during show are always far from optimal, but still each time I sat in this room I forgot immediately about the noise coming from outside, all that mattered was pure music. In fact once or twice I really lost a track of time because of extraordinary selection of music chosen by Kondo guys. This might not have been an audiophile's dreamed system, maybe not the most versatile one, but surely every true music lover (who often is not the same person as audiophile) must have appreciated absolutely unique feature of this system – the way it connected listener with the very essence of the music and how it allowed him to experience the most thrilling emotions. That's what Kondo did for me, that's all I expect from my dreamed audio system. Long story short – I loved it! At least I loved the sound of this system, because when it came to aesthetics of Kagura I had some reservations. Then they sported really ugly green on/off switches placed on the front. An amplifier was beautiful but this switch spoiled the whole concept, in my eyes of course. It seems I wasn't the only one to think that as the present version sports a very nice, fitting the whole design on/off switch. It's a beauty now. Louis Armstrong & Duke Ellington, The great summit, Roulette Jazz 7243 5 24548 2 2, CD/FLAC. The Ray Brown Trio, Soular energy, Pure Audiophile PA-002 (2), LP. Patricia Barber, Companion, Premonition/Mobile Fidelity MFSL 2-45003, 180 g LP. Lou Donaldson, LD+3, Blue Note MMBST-84012, LP. Arne Domnerus, Jazz at the Pawnshop, Proprius ATR 003, LP. Ella Fitzgerald & Duke Ellington, The Stockholm Concert 1966, Pablo Live 2308-242, LP. Kate Bush, The sensual world, Audio Fidelity AFZLP 082, LP. Bobo Stenson Trio, Indicum, ECM B008U0FJ9Y, FLAC. V.A. Mozart, Le Nozze di Figaro, Harmonia Mundi HMC 901818.20, CD/FLAC. Tomasz Stańko Quartet, Suspended night, ECM 1868, CD/FLAC. Etta James, Eddie 'Cleanhead' Vinson, Blues in the Night, Vol.1: The Early Show, Fantasy B000000XDW, CD/FLAC. Kari Bremnes, Desemberbarn, FXCD 247 CD/FLAC. Kaguras are big and heavy. That is sort of obvious when it comes to powerful tube monoblocks but I have to mention that to give credit to Mr Wojtek and people who helped him to get these monsters up here to my apartment. Size and, to some point, also a weight of these amplifiers require special stands to put them on as most racks won't be able to accommodate Japanese amps. As I didn't really have anything I could put Kaguras on I asked very last minute Mr Bartosz from Audiophilar, if he could help me out. Despite such a short notice he came up with two beautiful granite stands with adjustable feet that were big enough to accommodate reviewed monoblocks. Thanks to him we didn't have to put them on the floor and instead these two beauties could sit (comfortably :) ) on two equally elegant stands. Just as any Kondo product I'd ever seen also new flagship amplifiers look amazingly well in their simplicity. It didn't take much to notice that every little detail was a part of a greater idea of how extremely expensive device should look like. 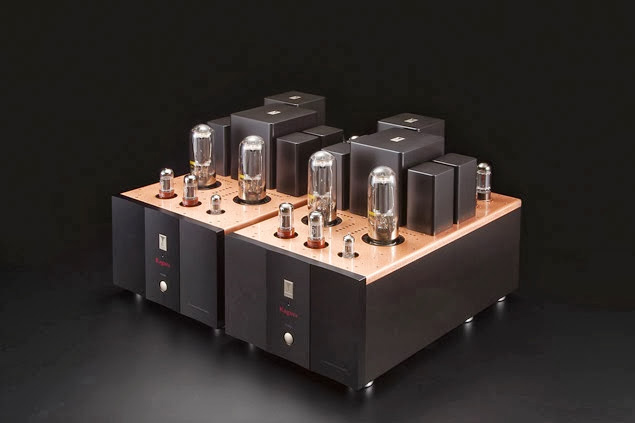 In fact Kondo's product are something more than just devices reproducing music, these are pieces of art so a customer who decides to buy them expects a look that says: this is one of the best and most beautiful amplifiers money can buy, and he gets just that. The copper top cover that holds tube sockets looks simply amazing. This material was chosen not only for its original color, but also for its shielding properties – top cover shields tubes from electronics working underneath. The casing has a rectangular shape with front and back being shorter sides. Tubes (accept for rectifiers) are placed in front with transformers covers, six of them to be exact, behind. The above mentioned rectifiers, four of GZ34, sit at the back, behind one of the transformers. Kaguras use two 211 triodes per channel in Parallel Single Ended setup which allows them to deliver 50 W per channel. That's enough power to drive most loudspeakers available on the market, not just the high-efficiency ones. Signal tubes' set per channel comprises of one 12AU7 and two 6SN7. Each monoblock has to be powered up with two power cords (main and heater). Manufacturer delivered Kaguras for tests with six power cables and two powerstrips. Kondo's Silver power cables were terminated with American standard plugs, so in fact I was able to use four of them to connect monoblocks (each with separate) power strips but to connect these two with my wall electric outlets I had to use my own copper PCs. Mr Wojtek delivered also Kondo's silver IC and speaker cables, and KSL-M77 preamplifier (Kondo is still working on their new flag preamplifier that should be a perfect match for Kaguras, it will be called G-1000, but it wasn't ready yet during this test). 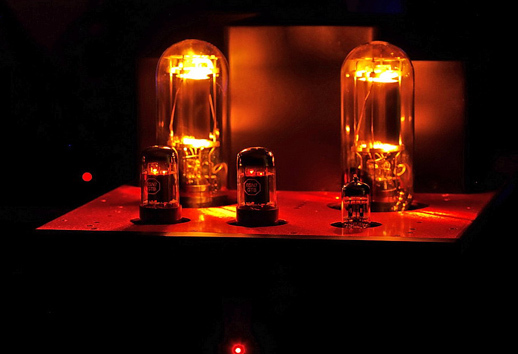 For first three days amplifiers worked with standard tubes and later distributor brought some high-value NOS tubes from his collection and we replaced standard signal and rectifier tubes with these. Let's start with my impressions from listening sessions with standard tubes. Just as most (if not all) SET amplifiers also Kaguras needed several minutes to warm up before they offered optimal performance. I did mention that already when reviewing Souga but I need to do that again – I simply wasn't able to ensure an accompanying system of an equal or higher class than Kaguras. 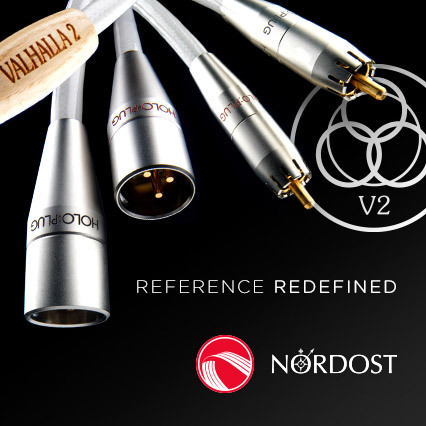 I was fully aware of that and so was the Audio Note Japan's distributor, Mr Wojtek Szemis. And yet, when the system was set up, turned on and we started to play the first record (on Zontek turntable, that I reviewed recently) it seemed that nobody present in a room really cared about searching for “weakest links” in this system. Kondo was doing it's magic from the very first second. It was, on one hand, the same sort of magic that Souga had delivered before, on the other hand it was different but equally convincing, equally enchanting. It was the same when it came to the effect it had on listeners – an absolute surrender to the music flow. Kaguras had the same ability of captivating listeners' attention from the very first sound right until the very last note – it was not really a choice, I felt compelled not to lose a single second of this outstanding performance. That these two amplifiers had in common. But on the other hand sound wasn't the same as I remembered it from my sessions with Souga. With standard tubes Kaguras sounded bit brighter and at the same time I could feel much bigger power headroom, and even more impressive dynamics. The “brightness” I mentioned wasn't really it. I thought it was rather about more linear sound presentation and bit less of the sweetness Souga delivered. Souga presented amazingly rich, sweet midrange and lower and mid-treble and these elements attracted listener's attention. Treble was vibrant, lively, rich, but also quite sweet (but not syrupy!). Here treble seemed better extended while also being rich up to the very top end. That delivered stunning cymbal performance on Bobo Stenson's Trio Indicum, as they were very distinct, powerful sounding, vibrant and lively, and, which was very important, the differentiation was amazing. As the treble was less sweet it sounded bit sharper, even more lively and that gave all cymbals and other metal percussion instruments a very convincing, true tone. I was equally impressed with realism of presentation of brass instruments like trumpets for example. Whether it was Louis Armstrong, Miles Davis, or more recent recording of Tomasz Stańko, it seemed to hypnotize listeners with how smooth or how harsh could this instrument sound depending on requirement of the moment. Outstanding resolution, also on micro level, allowed me to enjoy every single, tiny element of masters' play– every blow, every breathe, every movement of an instrument getting closer to or further from the microphone – it was all there, right in front of me. Sure, one doesn't need these elements to still enjoy the music, but once these elements are there one can finally appreciate a new, surprising but welcomed level of realism.